Whether you come to St Thomas by cruise ship or airplane, one of the “must do” things on your vacation is to rent a boat and explore the Virgin Islands on St Thomas Boat Rentals! To see as much as possible on one day, it is better to rent a power in St Thomas, rather than a sailboat, simply for the fact that you can go faster and see more islands. One of the great things about the U.S. Virgin Islands & British Virgin Islands is that there are so many islands close by. Even the British Virgin Islands are only 20-30 minutes away from St John. This really depends on what you want to do! The most popular itinerary for the day is to head out to a few snorkeling spots in the morning, such as Waterlemon Cay by St John, or The Indians by Norman Island, or the Caves, which are actually in the side of Norman Island. 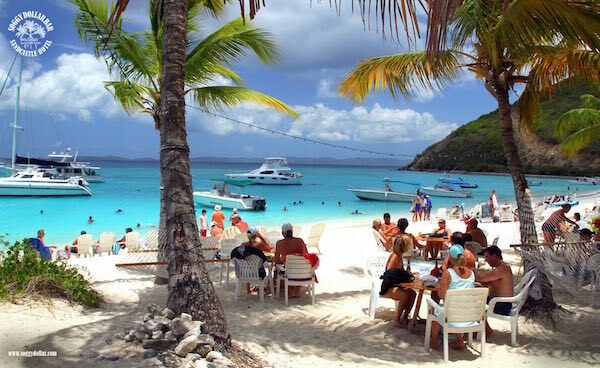 After snorkeling, most people like to find a nice restaurant on one of the fabulous Virgin Island beaches. Some of the favorites are The Willy T, Pirates Bight, Foxy’s, Sydney’s, or Pusser’s Rum Restaurant on Marina Cay. After that, you’ve probably worked up a nice thirst, and wouldn’t mind a few adult beverages…say, a Painkiller or two (three?). Probably the most popular island in the BVIs is Jost Van Dyke, the party island, and home to The Soggy Dollar Bar, Ivan’s Stress Free Bar, One Love, and countless more. Beach bar crawling here is an art form. It’s family friendly, too, as the bar owners do a good job of keeping everything PG rated – at least during the day! White Bay on Jost Van Dyke is not just home to the most beach bars, it is also one of the most stunningly beautiful beaches in the world. The color of the water and the sugar white sand beaches combine to make a truly surreal experience. For the best overall experience, be sure you get the right boat for your group. Beach Bum Boat Rentals has a wide variety of boats and our Bums will help you find just the right style, size and price for your group. For small groups and families, a 32′ Runabout boat would be perfect. For multiple families or groups up to 12 people, a Center Console boat gets everybody where they want to go quickly. Groups with older people or those who want a more luxurious, leisurely pace, an Express Cruiser Boat might be more your style. With large groups, you have the option of putting multiple boats together for your own armada, or renting a large, 46′ Catamaran Party Boat to have everyone all together. Whichever private charter boat you want in St Thomas, Beach Bum Boat Rentals has just the right boat for your specific needs, group size and budget. Contact us today to reserve your boat!